The latest news relating to GestTrack®. GestureTek AirTrack Hand Tracker Used in Shell RoadShow Interactive Exhibit. 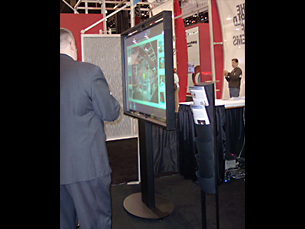 GestureTek showcases multi-touch surface computing, immersive media and portable hand tracking system for mouse control at 2007 IAAPA Expo. Tiny AirTrack Tracking Unit Makes Big Impression at Dubai AirShow. GestureTek earns additional patent for video camera control technology. Multi-camera gesture control protected under newly issued patent. This large interactive window is always exciting and draws attention to any display. A “digital signage” system that allows the user to “point to touch” the content. An ideal solution for multi-media displays for retail displays.